A few months ago I spend some time in Montreal on a business trip and the day of my return flight I had some hours to kill which I spend at one of the spotting areas at Pierre Elliot Trudeau International Airport. This airport which was formerly known as Montréal-Dorval is located about 20 kilometers West of the Montréal city center. 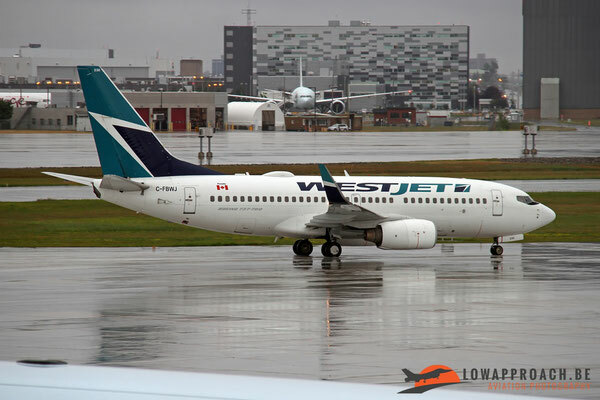 Despite the bad weather, it rained the whole afternoon, I used the spotting area located at 55 Street, which gives a great view on the 06R/24L runway. 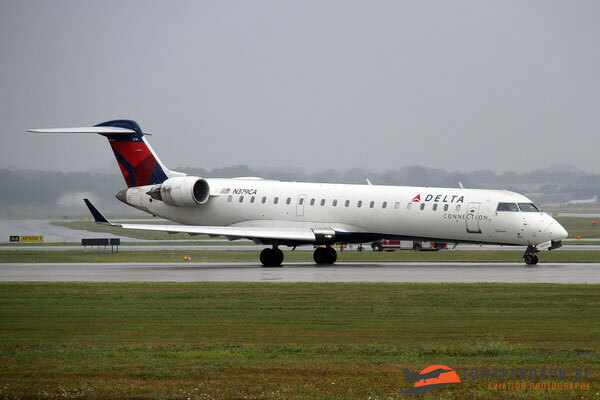 I spend about 2 hours at this location, before I returned my rental car. After check-in I went to the business lounge to discover that from that spot you also have a great view over the platform. 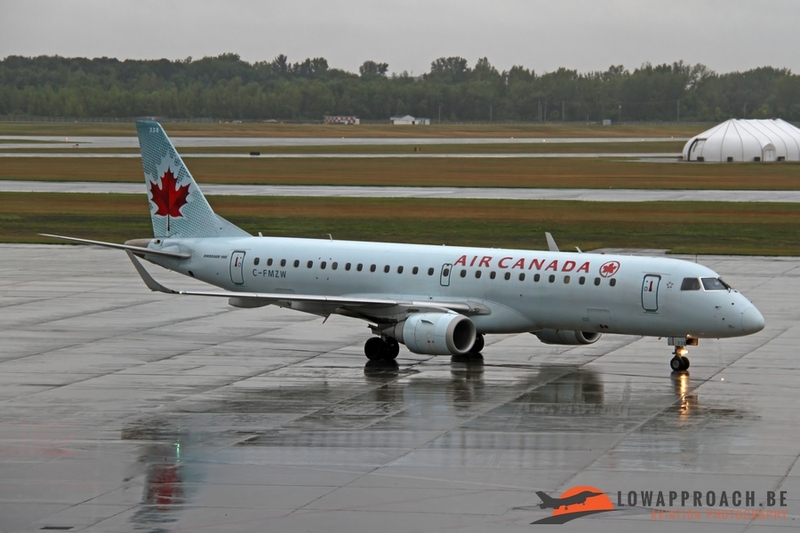 At Trudeau IAP the plane spotters are treated really well, the well equipped spotter area being a nice example of this. As you can see on the following two pictures the airport provides a nice park with seating for plenty people. 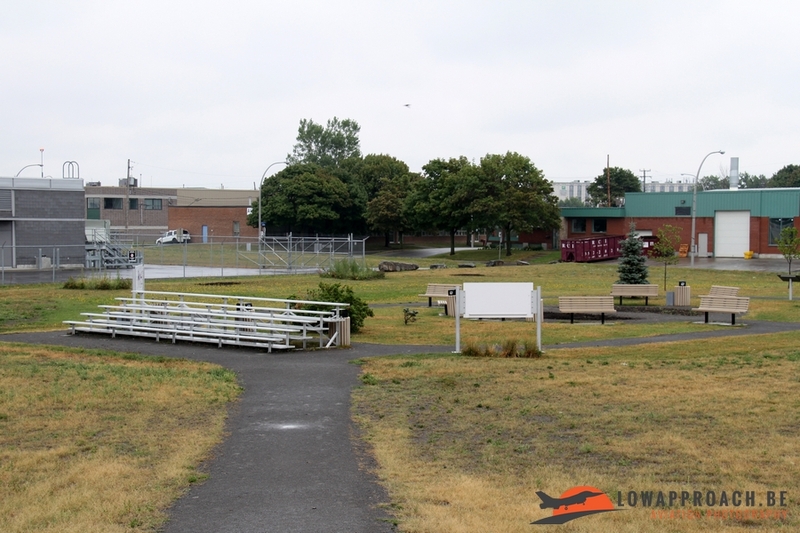 They even have a grandstand from which you can see the aircraft take off. 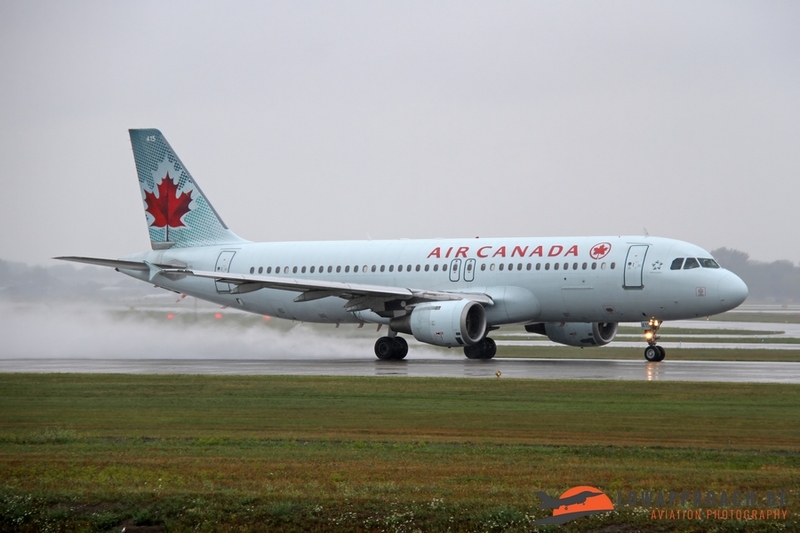 Also present is a ‘hill’ to make sure photographers can make their shots without any fences in sight. 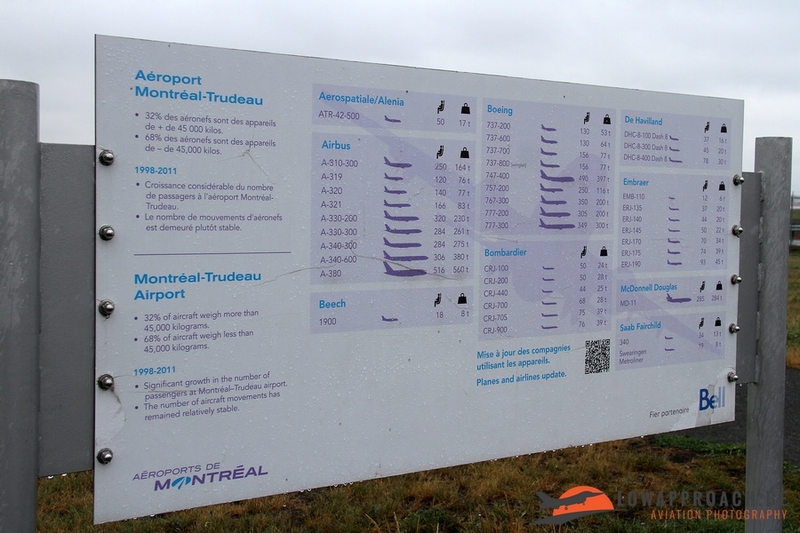 A panel giving details on the various aircraft types that use the airport is also present. 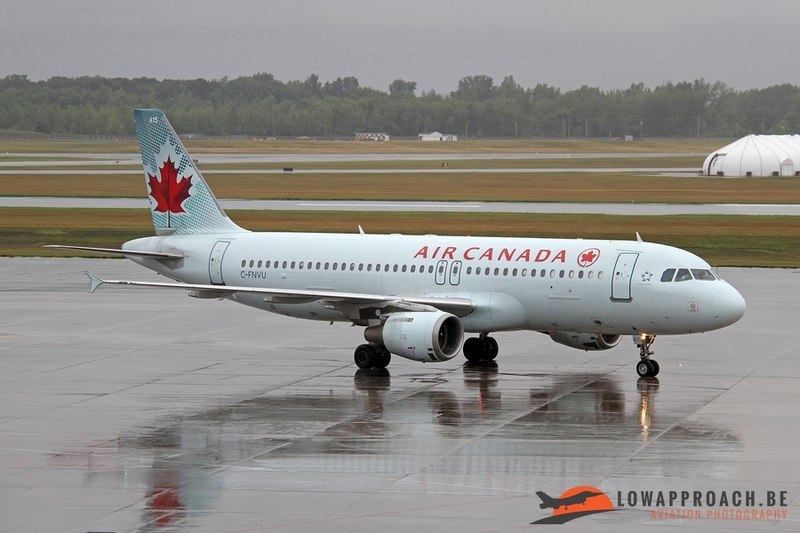 I’m not really an expert in civil spotting, but for me this was one of the nicest locations I ever visited. The biggest user of this airport is off course Air Canada, who uses this spot to offer a large number of connections to national and international destinations. The 06R/24L is apparently mainly used for flights within Canada and the US, so the range of aircraft I saw were mainly in the commuter category, but honestly I was happy with anything that passed my lens as all were new for me. 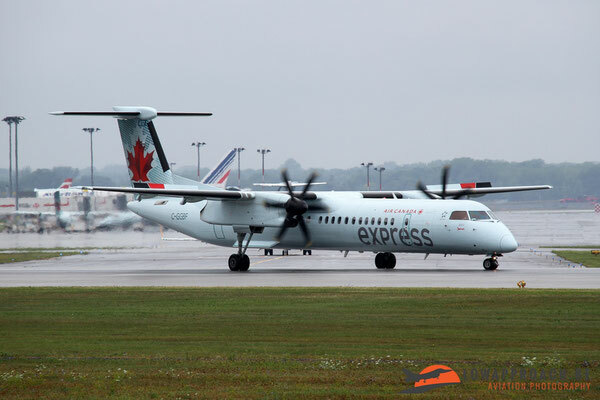 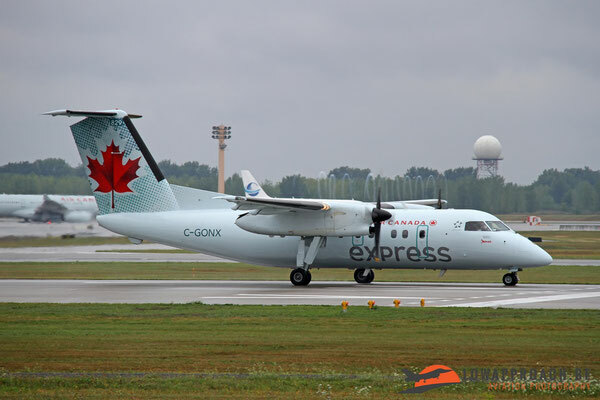 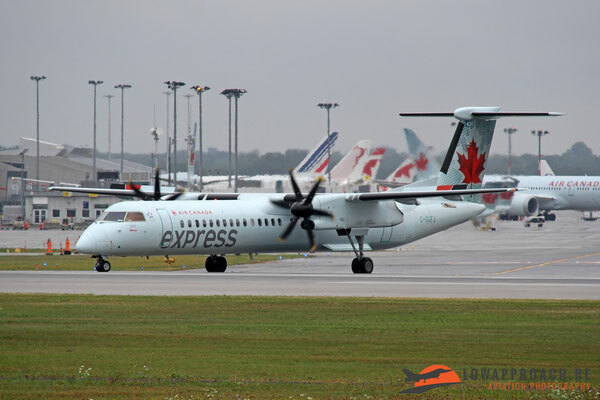 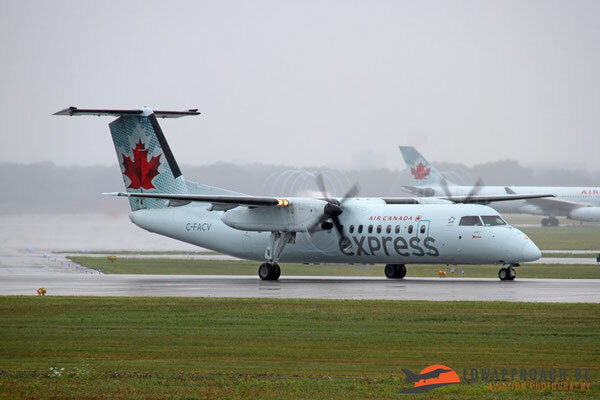 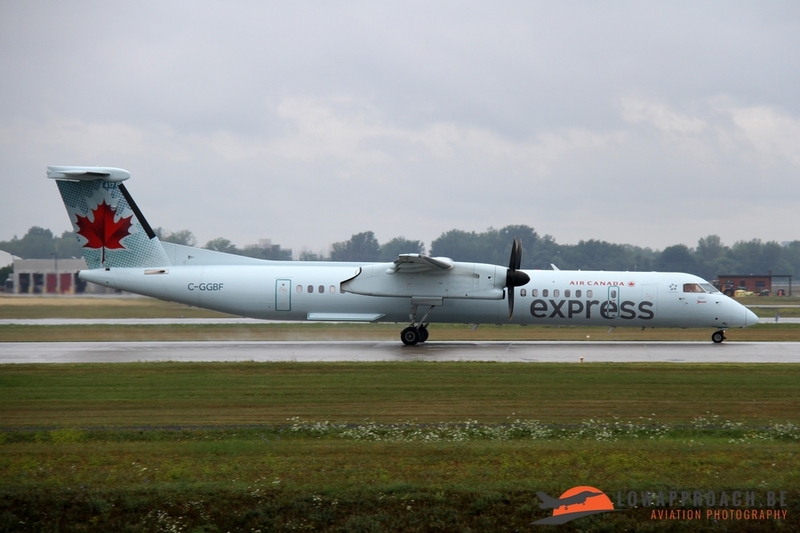 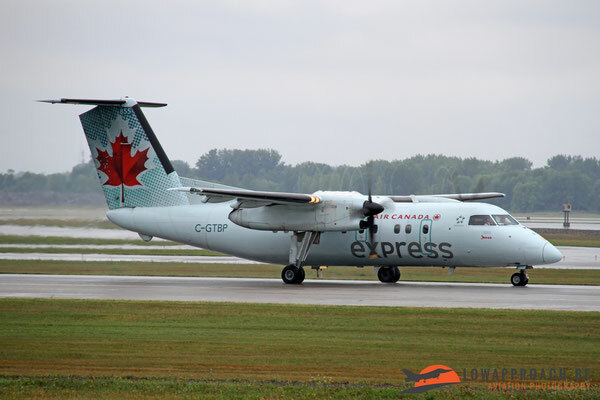 Air Canada is a large user of Canadian build aircraft and the first type I would like to present is the De Havilland DHC-8 Dash 8 or Bombardier Q-Series as it is known at this moment. Air Canada currently uses three versions of this aircraft. 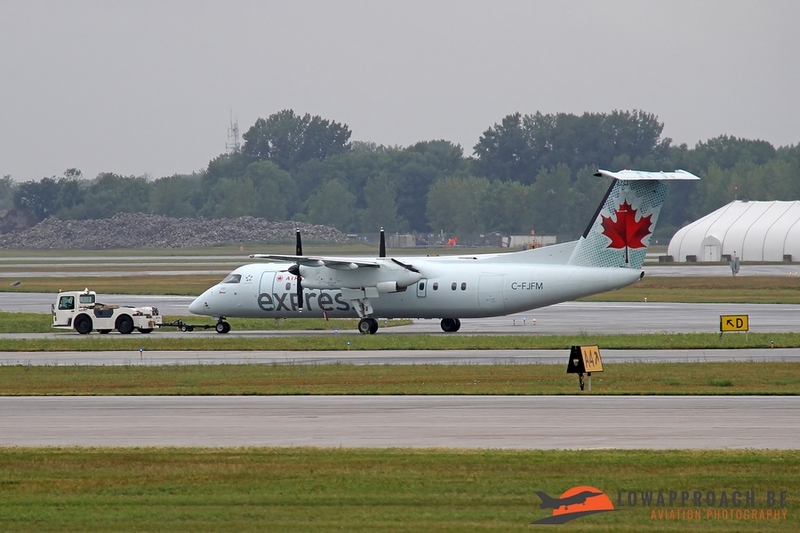 The original DHC8-100 (Bombardier Q100) with 39 seats, the DHC8-300 (Bombardier Q300) with 50 seats and the largest of the family the DHC8-400 (Bombardier Q400) with 78 passengers. These aircraft are operated by the Air Canada subsidiary Jazz. 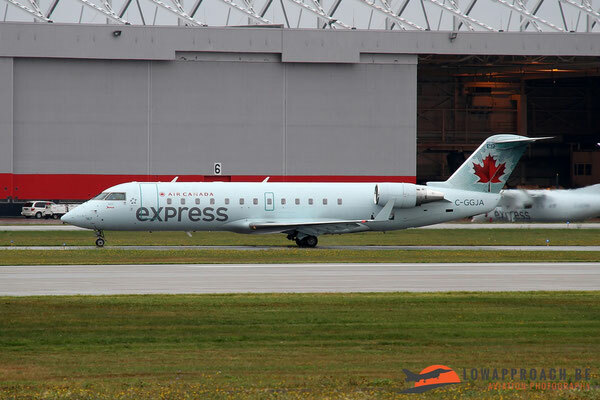 For the destinations with only a very small number of passengers Air Canada also operates the Beech 1900D operated by Air Georgian. 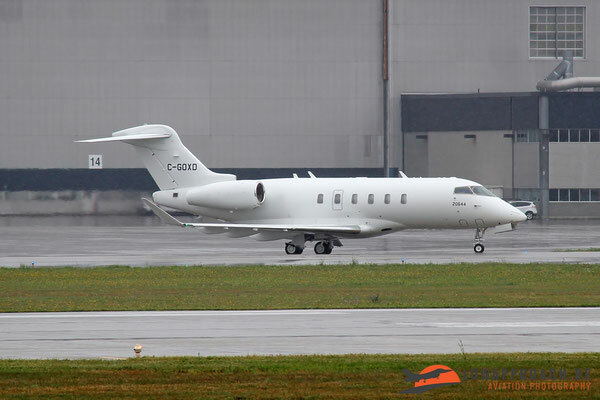 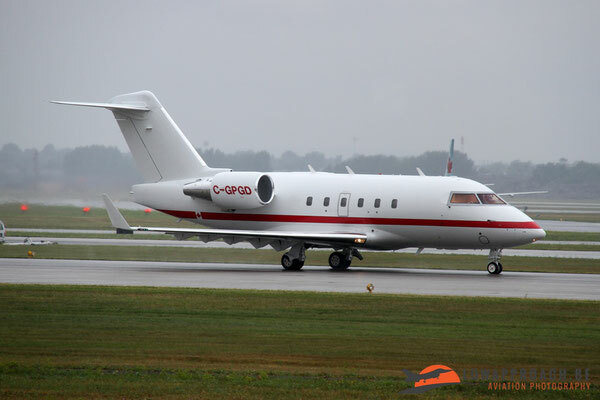 Next in line is another Canadian product, the Bombardier CL600, which was developed from the Bombardair (formerly Canadair) Challenger CL600 business jet, an example of this one can be seen on the first picture. 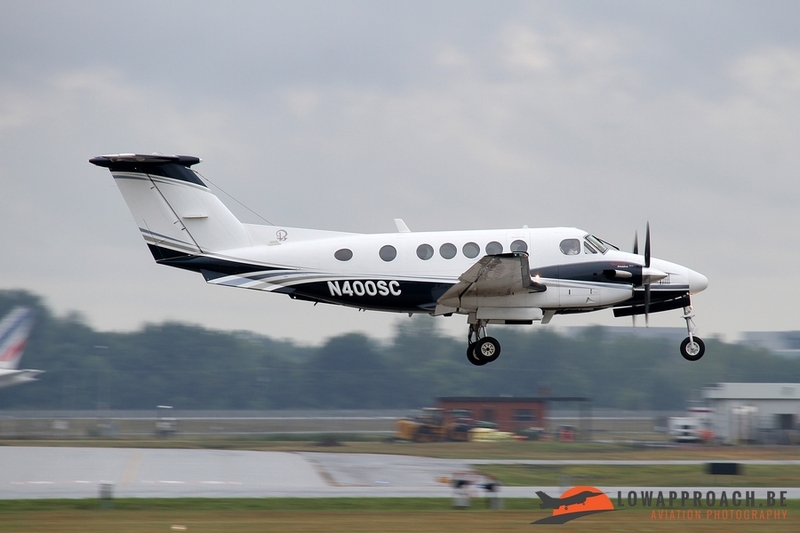 Over the years various versions have been developed each varying the number of passengers. 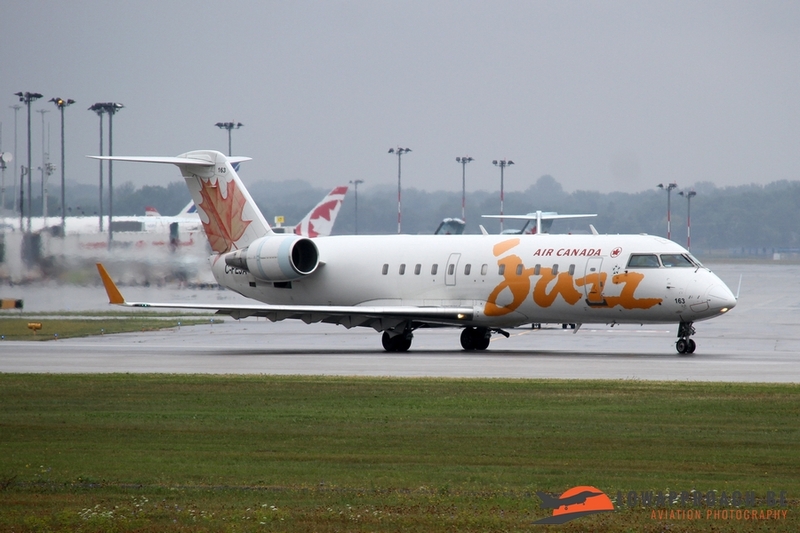 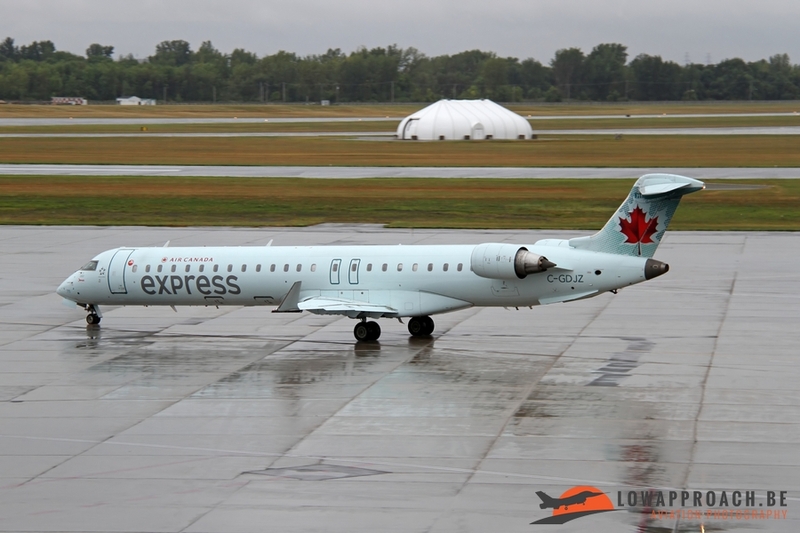 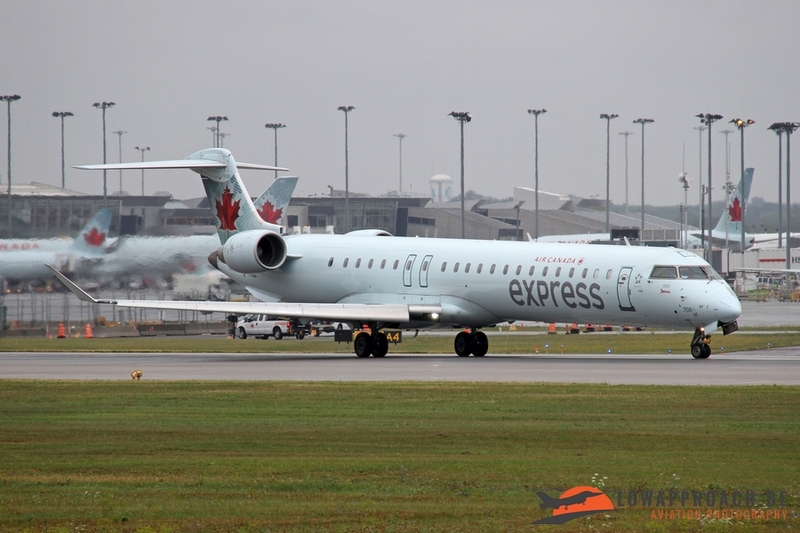 Air Canada/Jazz operates two different versions, the CRJ200 and the CRJ700 with 50 and 75 seats respectively. 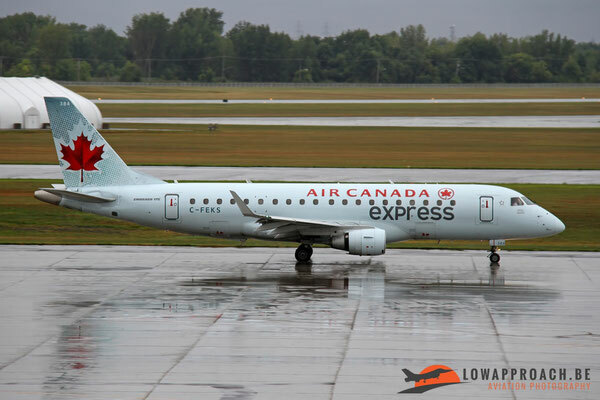 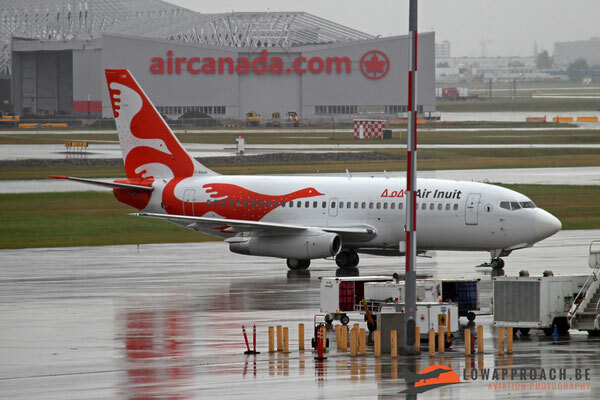 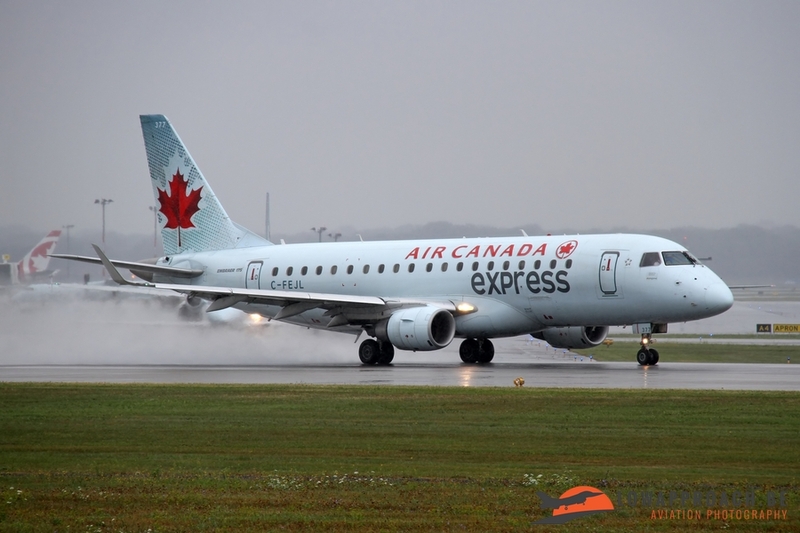 One step further up the ladder is the Embraer ERJ175/190 that is operated by Air Canada themselves. 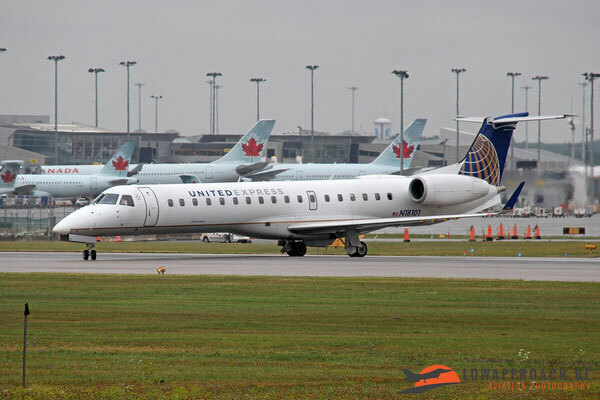 The ERJ175 is the smallest of the family with 73 passengers, with the ERJ190 having 97 seats. The two pictures on the platform were taken from the lounge. Air Canada is a user from various manufacturers, Airbus being no exception. 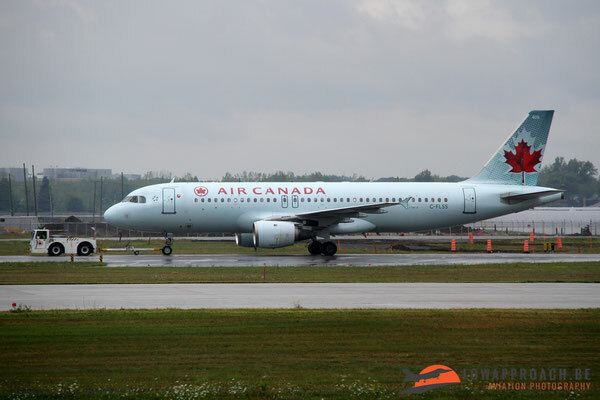 Although they operate aircraft from the A319/A320/A321/A330-family I only managed to photograph two examples of the A320-range. 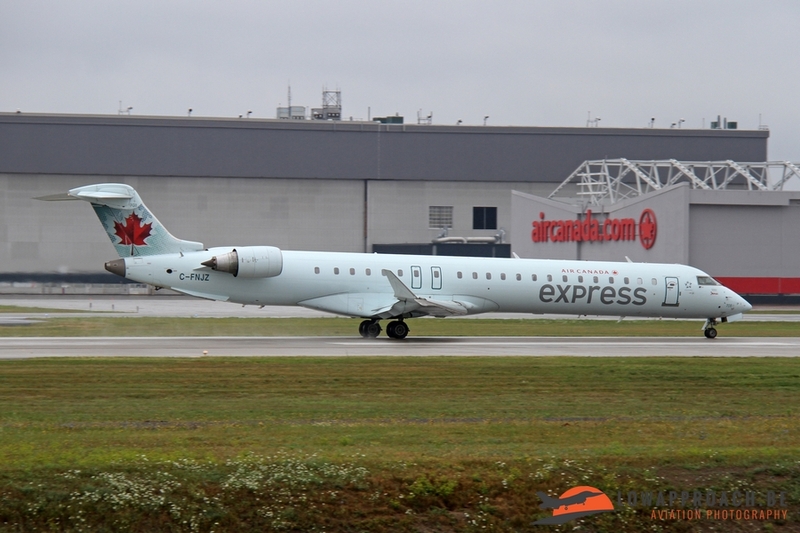 Flights can sometimes relatively short as one of the aircraft I even managed to photograph twice, once when it took off to an unknown destination and a second time a few hours later when it returned to Montréal..
We already saw a large number of Bombardier products, but one has to bear in mind that this company also has its main production plant Trudeau IAP at this location. And test-flights appear to be made on weekend as well witnessed by a brand-new Bombardier CL350 Challenger that arrived during my stay. 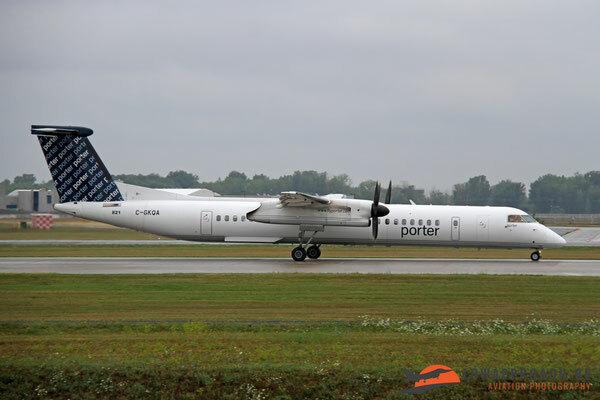 Other Canadian visitors I saw were a Beech B100 King, a ‘classic’ Boeing 737-2S2C from Air Inuit, a Boeing 737-700 from Westjet and a De Havilland DHC8-402 from the regional carrier Porter Airlines, based at Toronto. 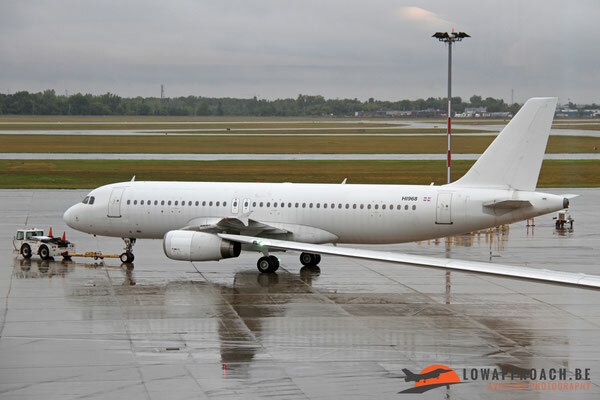 Foreign visitors were rather limited and mainly from the United States. I saw a private Beech B200 Super King Air, a Bombardier CL600-2C10 and CRJ700 from Delta Connection, an Embraer ERJ145 from United Express. 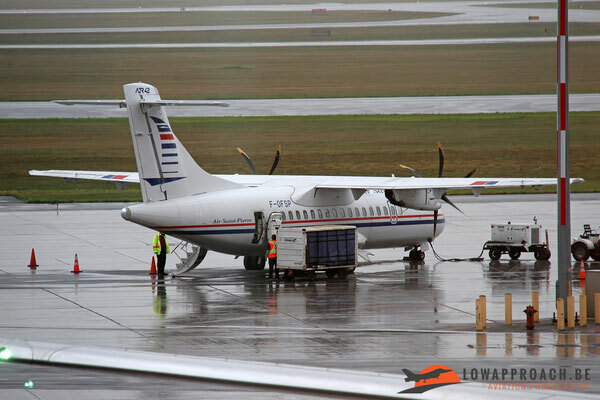 More exotic were an Airbus A320 from Dominican Wings from the Dominican Republic and the rarest of them all, an ATR42-500 from Air Saint Pierre. 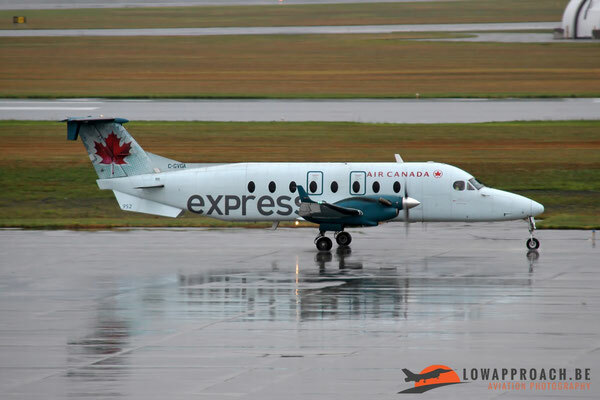 This small airline operates scheduled services between the French islands of Saint-Pierre and Miquelon-Langlade and Canada. 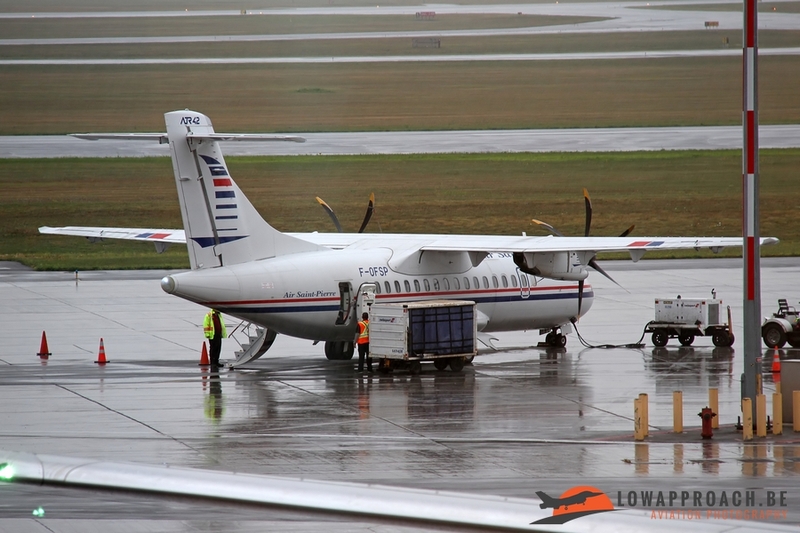 In total it serves 7 destinations for which it uses 2 ATR42-500s. 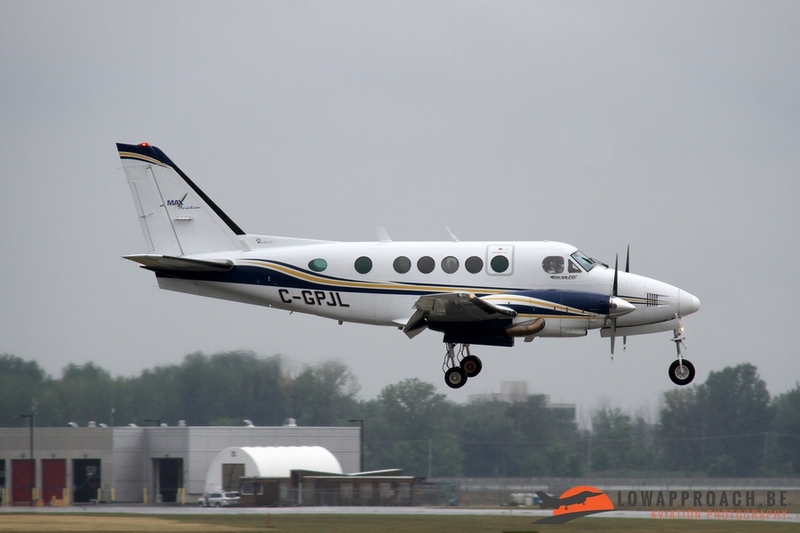 Both these islands are located of the coast of Newfoundland, but are still French territory, so the aircraft fly with the appropriate French Outre-Mer registrations. Despite the weather, it rained virtually continuously, this spotting experience was a very pleasant one with a large number of aircraft that I hadn’t seen before. The facilities offered at the spotters area are a real example for other airports, which hopefully they will follow soon. Hopefully I can spend a bit more time at this location somewhere in the future, with.... lots of sun.